I was skeptical of spaghetti squash at first. We grew them in our garden mostly for the landowner, but have had such a harvest I've simply had to come to terms with them. I had always been displeased with them in the past, I think because I was expecting them to be...well, squash. Or to be pasta. Truth is, they are not quite either of those foods but once I learned to stop expecting them to be something they are not, things have worked out well. 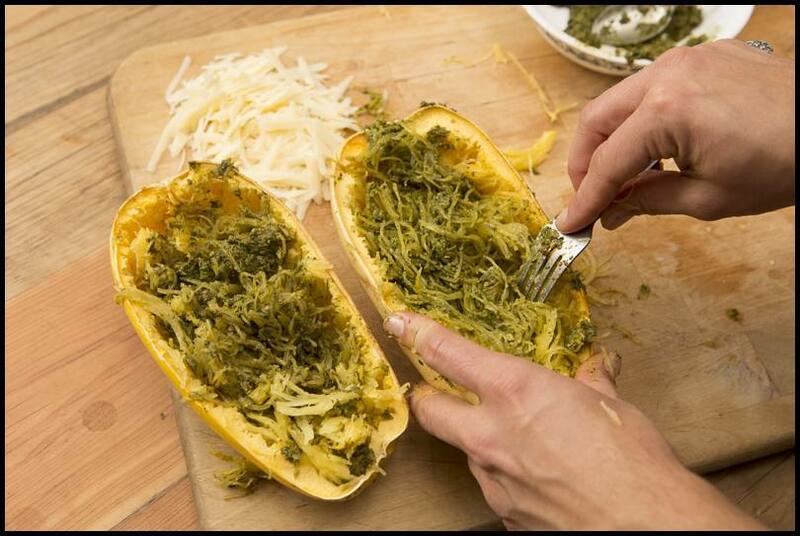 And so I offer you a convert's guide to spaghetti squash, the vegetable-based pseudo-noodle that serves as an excellent vehicle for pesto and other pasta sauces. When the inside flesh seems soft (i.e., easy to stick a fork into), pull them out of the oven and prepare for the magical step that turns a baked squash into a bowl of pseudo-noodles. 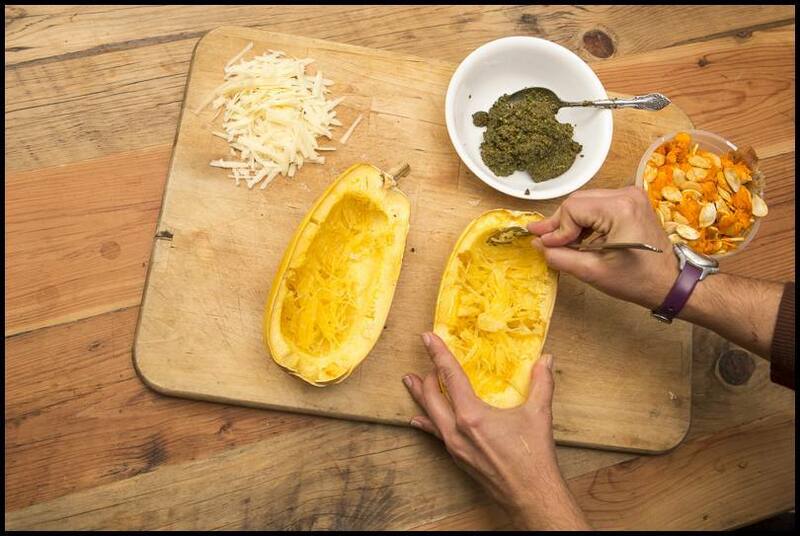 Drop a big spoonful of pesto into the squash cavity and spread it around. Then, simply take a fork and gently rake along the cavity of the squash, pulling the strands gently away from the edges, and fluffing them up. The pesto will start to mix in without much effort. You should be accumulating a nice pile of fluffed up "noodles" in your squash at this point; continue the process till you've pulled all the flesh away from the rind. Then, stir in additional pesto till you reach your desired level of sauciness. Now, you should have a nice little self-contained squash rind noodle bowl. You could eat it right now if you want, but if you have a little more patience it will get even better. Take those noodle bowls, top with cheese, and stick them back in the oven. Keep an eye on them, as this stage is short: 10 minutes or less. Once the cheese is melted and bubbling slightly on the top, pull them out and serve. 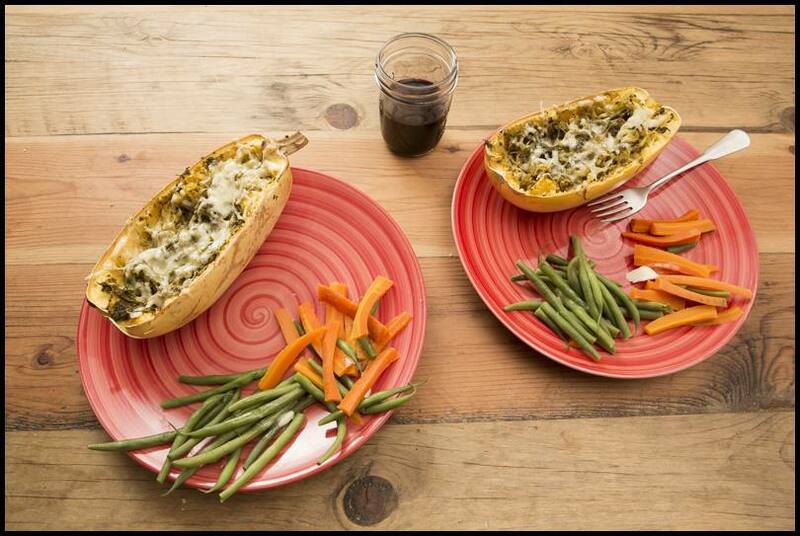 If you get some smaller squashes, they make great self-contained individual-sized bowls; a family or other group of picky eaters could even customize the type or amount of sauce, cheese, or other toppings, so everyone gets their preferred style. This is also a great way to enjoy traditionally pasta-associated sauces for people avoiding grains. We have also done these twice-baked squash with tomato based sauces, or with butter and cheese for an almost mac-and-cheese version. All are delicious. Squash, corn, and beans are among the staples of indigenous agriculture in the Americas. In some places the tradition of growing them all three together in a polyculture led to the trio being known as the three sisters. We grew the three crops in separate portions of our garden this summer, but they all ended up together at the table this week in a single dish we now refer to as the three sisters quesadilla. 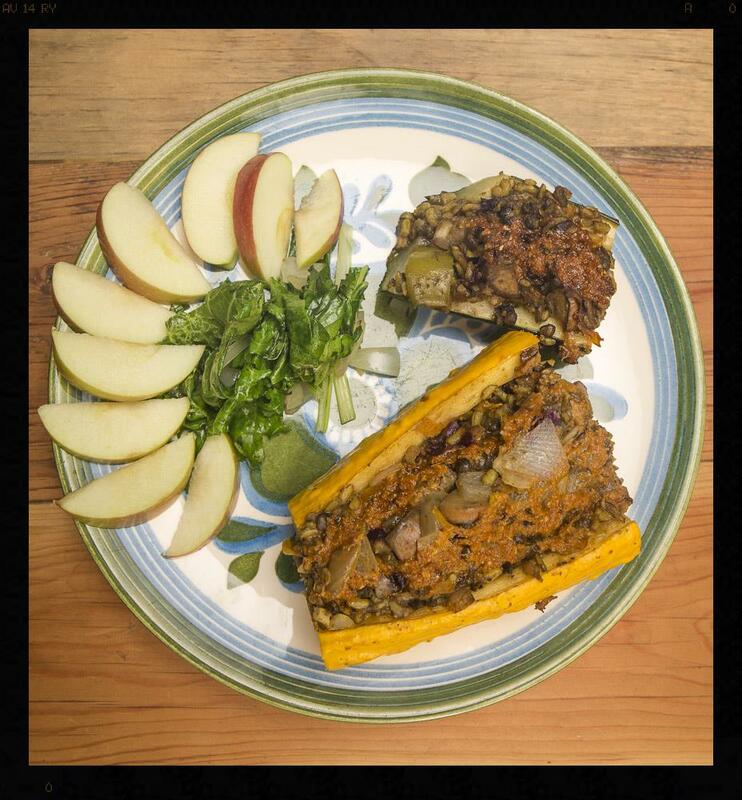 This dinner stemmed from two inspirations: a half-gallon of pre-cooked squash stored in the fridge and needing to be used up, and memories of black-bean and sweet potato burritos we've loved (sweet potatoes don't really grow here, so we haven't had those in a while). This is probably a good place to admit that this, like many meals we feature, did not begin as a grand pre-planned vision. It grew organically and unexpectedly out of what was on hand at the time. Sticking as much as possible to food you grow can force some creativity. That creativity can lead to brilliant discoveries or, well, less than ideal combinations. Sometimes popcorn is dinner. For today, though, we'll stick with another success. As usual I'll give you not so much a recipe as a set of directions. And not the GPS or google-maps kind of directions, but "turn left at the red barn, swing right around the stump, and keep on going till the bottom of the hill" kind of directions. Don't worry, you'll get close enough. First, ideally a day or two ahead of time, bake far more squash than you can eat. Scoop the leftover squash out of the rind, puree or mash it, and store it in the fridge trusting that you'll think of something. Next, start some black beans soaking the morning of your intended dinner. Convince yourself there is some sort of burrito-like plan for them and trust that it will come together by evening. Before going out to feed the sheep, set the beans on the stove and simmer them for an hour or more (unless you, perhaps, have not blown the seal on your pressure cooker, in which case you can cook your beans much more quickly and feed the animals whenever is convenient). About the time you start to get really hungry, decide the squash and the beans will go together quite well, and formulate a burrito plan (because there are still tortillas in the fridge, right?). Sautee a chopped onion, a few red-ripe jalapenos or other good pepper, and a big handful of garlic cloves. Add them to the simmering beans along with a little cumin, salt and pepper. Let all of them simmer till they are a good soft texture, adding more water as necessary. Pull out the bag of store-bought tortillas, and now.....choose your own adventure: are you lucky, and they are still good? Great, proceed to the last paragraph and save yourself some serious kitchen chaos. No, you see furry spots? Sounds familiar. Feed those to the chickens and keep reading. You're going to need to make some tortillas from scratch. Montana cornflour tortillas (in no way traditional, but they worked): take two large handfuls of kernels rubbed off of the dry flint corn hanging in all corners of the house. Run them through the grain attachment on the Champion juicer, and discover with great joy that they make a nice fine corn flour. Mix your two large handfulls of corn flour with one handful of wheat flour (ok, sure, you can use cups if that works better for you). Add a half-teaspoon or so of salt and a generous slosh of oil (or a quarter cup, if you like). Stir the oil in with a fork, then use your hands to rub it into the flour. At this point the mix should seem dry still, but hold together a bit if you squeeze a handful. Add just enough warm water to make a firm dough. Roll and pat that out into shapes as close to circular as possible, and as thin as you can get without breaking. Cook them on a flat hot skillet, flipping twice, till slightly browned on each side. Stack them up as they cook and keep covered with a cloth, so they stay warm and flexible. On each tortilla, spread a layer of the squash puree onto one half of the circle, and spoon a layer of black beans, then a layer of grated cheese. 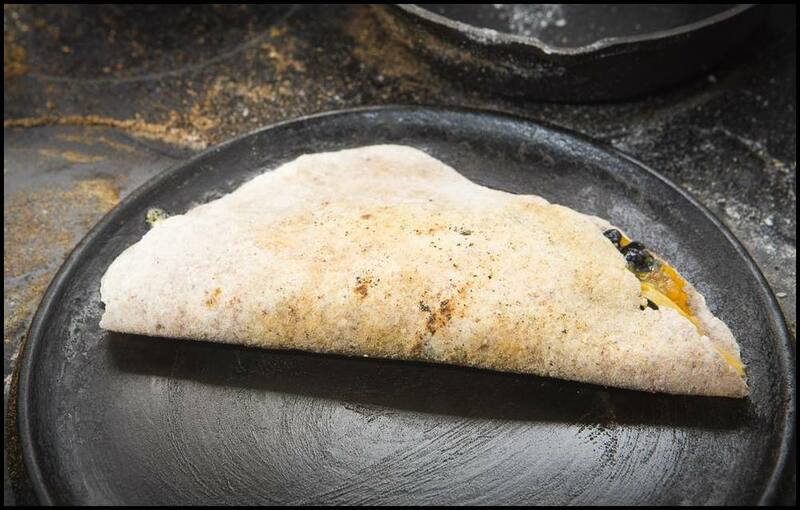 Fold the other half of the tortilla over to enclose the filling, and cook on a griddle untill the cheese is melted and the tortillas match your desired level of toastiness. Top with salsa, and perhaps the very last of the garden-grown red tomatoes. Enjoy. This week our featured meal is the one we shared on a neighbor's table on Sunday. We had joined friends and neighbors at Turner Family Farms for a special annual workday: the fall hog butchering. They raise a few pigs each year on their small farm, including their boys' 4-H hogs and a handful of others that are sold directly to neighboring families who agree, as part of their ownership of the animal, to help with the processing. We'll tread gently, in this space, on the topic of raising animals for consumption. We know how personal the decision to eat meat is, and that for some people it is simply unnacceptable. We, after various periods of not eating meat, have now chosen to incorporate animals into our diet as mindfully as possible, including being a part of the entire process. For us, one of the outcomes of a committment to knowing the full story of our food has been that we eat meat very sparingly. We are not quite as insistent as that couple parodied in the Portlandia sketch, who must request every detail of the chicken they order. But we do take some good-natured ribbing from family sometimes for our "where did it some from?" questions, and we do take the vegetarian or wild-fish option most often when eating out. Of course, we're not complete purists: we've succumbed to the pancetta-topped pizza at our favorite place without obtaining a full pedigree, more than once. And sometimes as a guest, it's best to simply eat gratefully and not ask too many questions. So, at events like potlucks we are usually pretty wary of the options. But when we broke for lunch at the Turner's, it was an interesting and different experience to be at a potluck where each contribution came from a family willing to engage so directly with their food as to help in the butchering process. And so we were suddenly faced with a surprising array of choices: slow-cooked barbequed chicken grown right there, home-smoked pork, and wild game chili with a squash and bean base. On the table, at a different table this week: the potluck feast on harvest day at Turner Farms. I have a theory that when people really understand and engage with what it took to produce meat, it tends to be used more sparingly: smaller amounts can feel denser, more nutritious. It doesn't have to be in a huge slab or the main event of a meal. And so, of course, the other featured foods were just as exciting and filled out most of the plate: cabbage slaw, kale and spinach salads, dollops of roasted winter squash, baked brie with huckleberry jam, and the just-unveiled sauerkraut the Turners make each year in a stone crock over 100 years old (the secret, they claim, to their successful and delicious saurkraut each year). It was a solid day of work, but felt like part of a long tradition, too. We cut and packaged up seven animals to be used throughout the year by about ten families. We ourselves brought home one-half of a hog, and are venturing into our first experience home-curing bacon. It's meat that will be a benefit to our cold-climate winter diet, gifts for family at the holidays, and sourced in a way that we can feel good about. It doesn't mean it's easy, but at least we are part of the whole process, all the way from the field to the table. Harvest day is all hands on deck, regardless of age. Several of us were brand new to this work this year, but Gus, in the lower right, is and old pro and called the shots in the packing room for much of the day. We had some special company for dinner "on the table" this week: Pat and Sharon are excellent growers who have established successful gardens literally around the world: at a Peace Corps assignment in Southern Africa; both the wet and dry sides of Oregon; deep soils of the Bitterroot Valley to their current impressive garden in the Ninemile Valley of Montana, where they have experienced a frost in every month of the year. All that garden starting means they are experts at building soils and building fences. They are the ones we called when stymied by how to stretch 400-pound roll of 8-foot fence. And what do you serve when some of your gardening mentors come for dinner? Homegrown, of course. In the whole meal, the only things we did not grow right here were: salt, pepper (collected by Noah on assingment in Sri Lanka), olive oil, butter (from Lifeline Dairy down the road), and wheat flour (grown in Montana but not by us), and some wine (we're working on that). Pasture raised lamb, roasted on a bed of potatoes, carrots, and onions, topped with rosemary, garlic, and red wine sauce. Kale picked moments before dinner from the bed of covered greens, sautéed and topped with toasted walnuts and pears. It has turned extra sweet from the recent hard frosts. Sourdough rolls, from a starter originating from our friends at Quail Springs. And of course, because the Sweenys are the sort who show up with work gloves, sun hats, and two pairs of fencing pliers when asked to stop by and give us some fencing advice.....well, they brought dessert. For us, it was the first pumpkin pie of the season, delicious, and it introduced us to a new plant to love: the "Winter Luxury" pumpkin. They say it is the very best pumpkin for pies. We'll be putting that in the garden notes to order for next year's growing. In the meantime, we're grateful for the luxury of warm evenings with good friends and food. We've been in a bit of a frenzy here lately, getting ready to leave the farm to attend a workshop at Quail Springs. The trip preparation happens against a background of wrapping up harvests, processing food, a major woodworking project (the first one with a deadline and a payment), and some serious thoughts and planning about our next move. At the moment our beloved barnboard kitchen table reflects that chaos: baskets of squash and ripening tomatoes share the space with a DeWalt drill, a bottle of wood glue, the extra-large first-aid box and some pruning shears. In the midst of all this end-of-season activity, it seems like a good week to share something a little less tangible that is also at our table for each dinner meal: a ritual we call gratitudes. Maybe it's the fact that this week started with the Canadian Thanksgiving holiday, or that we are headed to spend time with people who inspired the start of this practice in the first place, but it seemed like a good week to explain and share this simple exercise that has become a regular part of our days. Each evening when we sit to dinner--even if that is just a quick stop to pick up a slice of pizza while out on errands--we take a moment to each say, out loud, something for which we are grateful. Sometimes the grattitude is one single thing, a clear highlight from the day; sometimes we have a long list, a conversation that continues as we eat. When friends or family join us, it sometimes becomes a series of celebratory toasts. Homegrown food and gratitude on the barnboard table. Photo by Noah. Plenty of research shows that expressing gratitude can have powerful benefits on mental health and happiness. We feel those benefits, of course, but the reasoning is less academic than that: simpler and closer to home. It feels good to take those moments to be grateful, and the influence extends past that pre-dinner conversation. I find now that as I cook dinner, while the front of my mind may be focused on gathering and preparing ingredients, another part is gathering and turning over the potential grattitudes for the day. In that sort of unconscious sifting, seeking the best grattitude for the day, so many other small ones are identified and acknowledged, too. The structure of tying this practice to a meal, something that we do every day, helps enforce the ritual even on days where it takes a little work. Because there are some hard days--days where we sit in silence for a long moment feeling the effort of finding that grattitude. More and more I think those might be the days when it is most important to identify, articulate, and feel it. The ritual is a reminder that there is always something, even on the hardest of days, to be grateful for. We've worked in regions where a daily dinner is not a certainty for everyone, and no matter how bad things might be, we know that if we sit down to dinner there is that: we can be grateful for the food. We are grateful, this week, for the food that is still, even now, streaming in from the garden: for hundreds of pounds of squash, potatoes, and more piled up in all corners of home, garage, and barn. We are grateful for friends and neighbors who have come to join us at our table with their thoughts, ideas, and offers of help. As the garden winds down, we are grateful for all we have learned and grown and harvested from it this season. This week we invite you to try the practice yourselves, on your own table. What are you grateful for today? Feel free to share your gratitudes in the comments here, or aloud to the people you gather with at your table. We're happily in the season of a little of everything in our meals these days. More and more of the harvest is piling up inside our house as it comes in from the garden. And I mean piling up very literally: on shelves, in buckets and boxes and baskets on every surface. Part of what that means is a fantastic span of ingredients within easy reach. The other part is that every evening we jump into some sort of food-preserving project, many of which last late into the night. Someday we may have a root cellar, a greenhouse, or even just more storage space. But for now, we have 200 pounds of winter squash in the living room and I'm grateful for every one of them. For the most part we are not using any of the preserved food yet, just reveling in the freshness still available. It's a luxury for a quick and easy stir fry to have both red and green onions, green and yellow summer squash, green bell pepper and and red sweet peppers, both. Not to mention the red cabbage and green cabbage...both, and all of it from a browse through the fridge and harvest buckets. A simple stir-fry has a full range of colors at this time of year as we have just about everything to choose from. Late summer garden on brown rice. Photo by Noah. Lately that little-of-everything stir fry has been topped with one of our first batches of preserved food: Kimchee. We started experimenting with natural fermentation this summer, and on one epic night of pickling in August we made our first batch of sauerkraut and our first venture into Kimchee all at once. Our friends who came over to help pickle were following more traditional Korean methods for this spicy condiment (including mysterious and partially-translated pepper spice packets sourced from Asian grocers in towns much larger than Missoula) but we went with, as they put it, "the hippie version." We used the recipe from the "Nourishing Traditions" book that includes Napa cabbage, onions, garlic, hot peppers, carrots, and ginger. We mixed everything with salt and pounded it in a large bowl till the leaves softened and juices start to form. After that we just packed it into quart mason jars that sat on the counter for 4 or 5 days. We left town for a few of those days for Noah's birthday--completely unrelated to the fact that the action of the naturally occurring beneficial bacteria that immediately started to work can produce, well, a strong smell. The neighbor stopping by to feed the cats while we were gone was diplomatic enough not to mention anything. If you try this, do be warned that the juices will overflow, and you'll have a distinct sour-pickle smell for a few days (but it's really not that bad). And it's worth it! This batch came out as a refreshing tangy gingery, slightly spicy condiment that we've been putting on top of just about everything. Our first batches of Kimchee have been topping a lot of dishes already. The three quarts we made might not last as long as we'd expected. Photo by Noah. On the table this week is a meal that we also delivered to friends as part of a neighborly dinner exchange. Fall started this week by both the calendar and the temperatures, but we're still considering this a summer dish. It's one that literally stuffs in some of the best of summer. The inspiration comes from those overgrown zucchini and summer squash that have gotten away from us in the past few days while there was so much to harvest. It's great to have a use for them other than as baseball bats or chicken feed. 1. Sautee a small handfull of onion and garlic in oil in a heavy pot. Add a rice or grain blend and stir with the onions and garlic. We had a mix of brown rice, wild rice, and lentils on hand, but anything would work--straight rice, quinoa, etc.. After rice has toasted a bit and been coated with oil, add water and bring up to a boil. 2. Turn the grains down to a simmer while heading out to garden to pick other vegetables to include. Allow yourself to be distracted by chicken feeding and other garden tasks; harvest the entire row of black beans to bring into the barn to dry (optional of, course, but that's how we did it). 3. 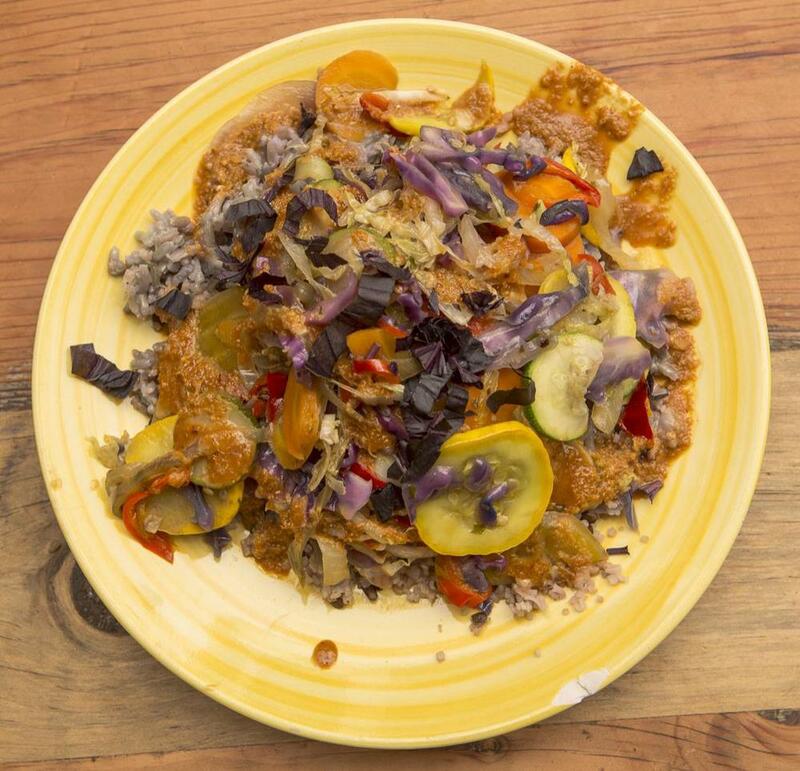 Remember that there is rice on the stove, and pick up the pace a bit to find some good vegetables to include: red cabbage, carrot, onion, garlic, eggplant, green peppers. Also pick those giant, ones-that-got-away zucchini and summer squash, relishing the knowledge that you finally have a good use for them. 4. Back in the kitchen, chop up all the veggies of choice into small cubes and stir-fry lightly. Mix the veggies with the rice and any spices or sauces you like (this time we went with ginger and garlic sauce from a favorite recipe book on seasonal eating: ). 5. Cut the zucchini and summer squash in half, scoop out the seeds and inner pulp to make space for stuffing, and pack the rice and vegetable mixture inside. 6. Put the stuffed squashes on a tray and bake at 375 for around 40 minutes, or untill the outer squash is soft. Pull out and top with additional fresh garlic-ginger sauce. 7. Arrange on plates, deliver to neighbors, then sit down at a barnboard table to enjoy. We knew from the start that the goal of growing most of our own food would inevitably change our eating habits. We don’t want to take on a 100-mile diet experiment or make cooking and eating into a complicated set of rules. But we do want to source as much of our daily food as possible from our own growing spaces and gatherings. More and more we find ourselves looking at our plates and saying, with a new sort of satisfaction "wow, we grew all of this." We're making a little space here to share with you what finds its way from our gardens to our table as we move through the seasons. In these posts we'll highlight one meal each week that shows how we are making use of the ingredients we've grown, gathered, and put up. We invite you to join us at the table by trying these meals out yourself, planting some of these ingredients into your next garden, or leaving a comment or link to what is on your own table these days. This week, we're sharing these stuffed California Wonder bell peppers. We consider any good stout mature peppers in Montana to be a wonder, and these, though their name says “California” have done great in our sometimes-chilly valley. We hope to stretch another week or two of growing season before the big frosts, to let some of them ripen to red (though they are tasting great green, too). To make this, we took some of our biggest bell peppers and cut off the tops to pull out the seeds and cores. The inside filling is sautéed from-the-garden garlic, onions, Jimmy Nardello peppers, coriander seed, jalapeños, sweet corn, and black beans (our first effort growing dry beans has also been an exciting venture). Mixed with a bit of brown rice, olive oil, and local cheese (not ingredients we've managed to grow ourselves yet), we stuffed the filling into the peppers, set them upright in a baking dish, and roasted them at 375. Pulled out after 30 minutes, we topped them with fresh tomatoes and the salsa we made while they baked. I'm not sure that an advanced wine-and-food connoisseur would chose blackberry wine as the best pairing for this, but, well, it's what we have because it's what we've made! For these homesteaders at least, the stuffed peppers went beautifully with the Oregon blackberry wine and a slice of homegrown Golden Midget watermelon for dessert. Why we write. On our home farm, we see connections between what we do and the farmers and people we work with around the world. We share these adventures here to invite you into the learning and community, regardless of where you are located. All content is © 2012-2013 Forest Voices, Mary Bricker, and Noah Jackson. Please do not use images or content from this site without our permission. Thank you!